Eastern cougars, or mountain lions, are wild felines that resemble the common bobcat, but cougars are larger in size and stature. Their most distinguishing features are their slender bodies, their small, broad, round heads, and most importantly, their long tail, which measures 26-32 inches. They have short fur that is tan in the summer and gray in the winter. Recognizable markings on cougars include a creamy white color on their muzzle, chin, and belly, and black markings under their whiskers, behind the ears, and on the tip of the tail. 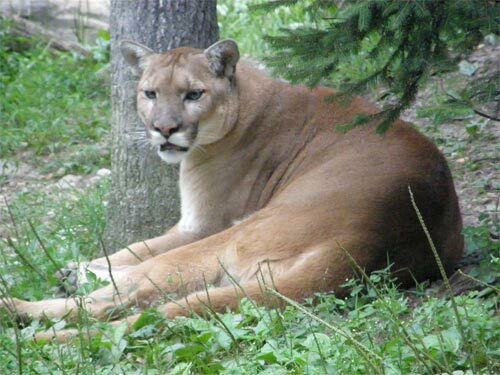 The adult cougar is usually 5-9 feet long, and it weighs between 80-225 pounds, with an average of 140 pounds. Similar to other species, cougar males are generally larger than females. Cougars are powerful predators, and they prey on a variety of animals. While deer are their preferred prey, they are also known to eat smaller animals as well, such as domestic animals and livestock. Back in the 1500s, European settlers were unaware of the presence of the cougar species in eastern North America, and they confused them with the more well known lions and leopards. Due to their size and predatory habits, settlers soon viewed them as a danger to both themselves and their livestock, so their extirpation from the region began. A combination of mass cougar huntings, deforestation, and market deer hunting contributed to the decline of the eastern cougar population and their near extinction by 1900. In the mid-1900s, cougar sightings were rare but still occurred in remote areas. The number of reports were enough to place the cougar on the 1973 Endangered Species Act. By the 1990s, definitive field evidence of cougars living in the local area was confirmed through DNA analysis and other research methods. Although cougar spottings are reported every year, the ones in the Adirondacks and eastern forests are currently regarded as an unsustainable breeding population. Many state and federal wildlife officials believe these cougars aren't native to the area -- that they are released or escaped captives, or traveled from west to east. Researchers see these traveling cougars as the odd young, subadult male on the hunt for a partner rather than any sort of major migration to the east. If there is a population of eastern cougars in the Adirondacks, then it is likely a very small one. Most cougar sightings are isolated instances, and the New York's Department of Environmental Conservation (DEC) notes that they usually involve cougars not native to the state. Hoaxes and photos of the eastern cougar outnumber the credible encounters. Along with Adirondack gray wolves, the issue of species reintroduction affects the eastern cougar's current status. While some people believe reintroducing cougars would benefit the area, such as establishing a form of wild animal population control, others see this type of project as uneccesary. However, conditions have changed since eastern cougars nearly went extinct in the 1900s, and deer populations in the eastern part of the country are higher than before. Many of today's cougar spottings are reported to advocacy groups or directly to the DEC. A lot of these sightings are cases of mistaken identity because of their similarities to other wild and domestic animals. Despite the multitude of false reports, some sources are marked as credible, and they support the continued presence of cougars in the Adirondacks. Cougars are solitary hunters, so the chances of a person encountering one are low. Their shy personality diverts them away from humans, and throughout the country, more people die from lightning strikes than by a cougar attack. Nevertheless, it's up to the state and local communities to decide if cougar reintroudction is an option to consider in the future.